Cows just may become walking cure machines. Gene editing in animals usually come in the form of livestock that live longer or are resistant to disease. But scientists and futurists often say that GMOs can provide much more than improved foodstuffs. An American startup is offering a glimpse of a more creative use of gene edited animals. Sioux Falls-based SAB Biotherapeutics is looking at genetically modified cattle as a means of providing fast response to epidemic outbreaks. They wants to turn these cattle into plasma factories, capable of producing blood plasma and human antibodies at a faster rate than humans could. In cases where there is a large outbreak, like recently with Ebola, the go-to response is pumping sick individuals with plasma. Plasma has protective proteins and antibodies that can help the sick battle the virus. SAB wants to do the same thing, but with cattle. The company has developed a process where cattle is gene edited, removing certain animal genes and replacing them with human ones that generate human antibodies.. 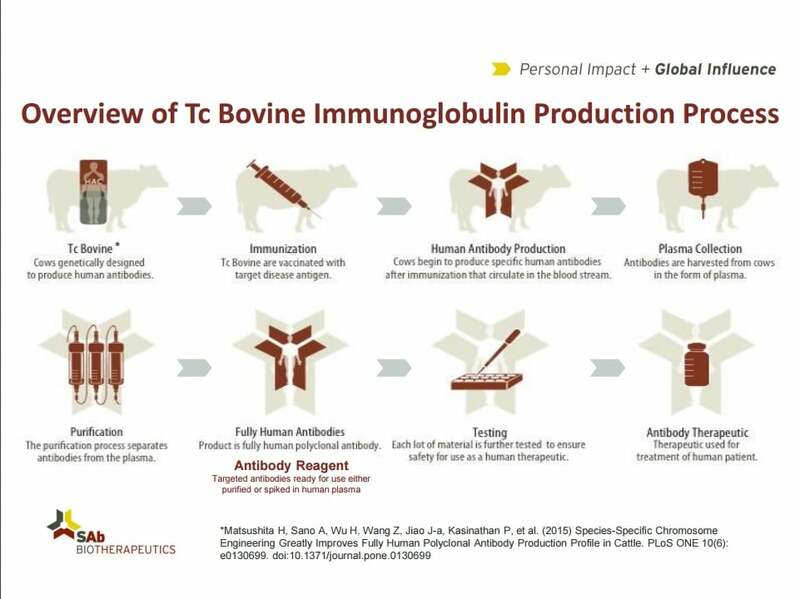 The cattle are then injected with a target disease antigen, spurring an immune response, thus generating antibodies. “Two key benefits of our unique technology platform are its ability to respond rapidly and produce potent fully-human antibodies to a wide variety of disease targets, including viruses, bacteria, and toxins, in significant quantities,” SAB CEO Eddie Sullivan said in a statement. There is currently a glut of research focused on gene editing. Other than creating better crops and food products, gene editing research is currently focused at modifying disease-carrying pests so they don’t reproduce, or creating better vaccines. Eventually, gene editing may find a way to edit out harmful disease, or make humans more resistant to tough diseases. Of course, there is much debate in this area, from the ethics of creating “designer babies” to the dangers of human “germline” editing.